1. Umbrella Prints Trimmings Competition: visit the Pinterest board here to see all the entries and repin the ones you like -- my Mosaic Bag is in there too. The project with the most repins wins the viewer's choice prize, and there are some insanely gorgeous projects. I'm having a ball just going through them all this morning and doing a little pinning of my own! 2. Let's Get Acquainted New Blogger Blog Hop: My friend Beth from Plum & June is bringing back last year's wildly successful blog hop for another run. 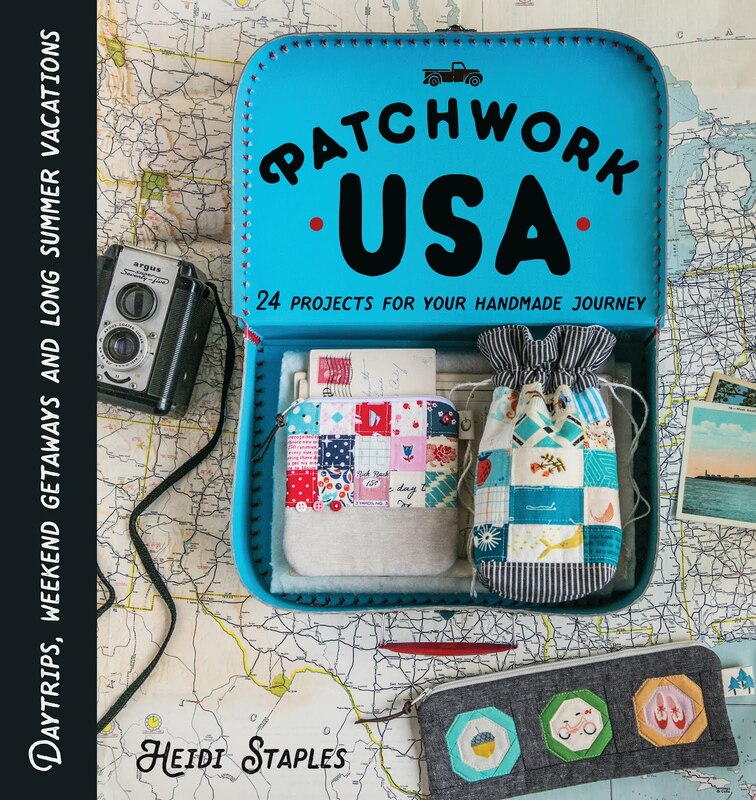 So many bloggers out there give Beth credit for introducing them to a wider audience, so if you're new to the online quilting community, you'll definitely want to get in on this before all the spaces fill up. I'll be guest posting for the blog hop on June 8th here at Fabric Mutt. 3. Season By Hand Blog Hop: Jennie at Clover & Violet is hosting a blog hop all about hand sewing projects -- such a great idea for staying crafty during summer travels. I have a project I've been working on for a while that I'm hoping to finish by June 14 which is my stop on the blog hop. There are going to be some great posts and amazing bloggers involved, so be sure to check out all the details. 4. 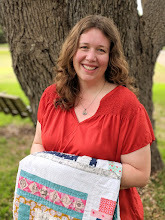 Kate Spain Blog Hop: Alyce at Blossom Heart Quilts is celebrating all things Kate Spain in the month of June, beginning and ending by interviewing the lady herself. 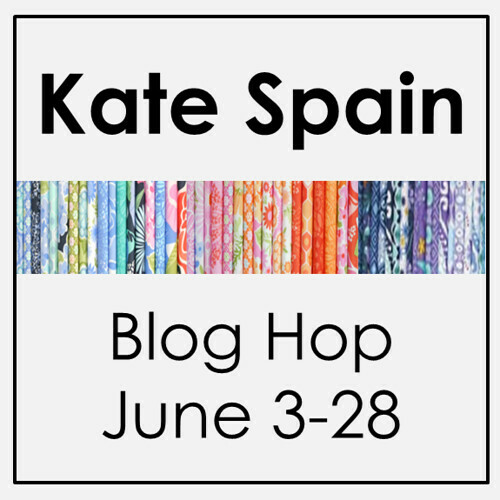 All of the bloggers will be sharing projects we've made with Kate Spain fabrics -- I'll have mine here on June 18th -- and you'll have the chance to link up your own for some wonderful prizes. You can even submit questions for the final interview if you get them in before the month is out! So there you have it -- June is going to be one big sewing/blogging/hopping extravaganza. Sounds like fun to me! I considered so many different names for this quilt, but in the end I realized that the best one was simply "Summer." The colors and prints that made their way into this piece remind me so much of the lazy summer days we spend here in Southern California on the edge of the desert. Blazing hot afternoons that fade into quiet evenings on the back patio. Long walks at local botanical gardens where my girls play hide and seek between the fruit trees. Our annual road trip to Arizona for a week with my husband's parents where we swim and hike and look for bunnies among the cactus each night before bed. These are the moments, I tell myself often, that I'm going to want to remember someday. Fabrics by Heather Ross are the star here, but there are also a variety of other prints from my stash included. I tried not to stray far from a color palette of pale blue, orange, yellow, brown, grey, and white. The chocolate brown print by Lotta Jansdotter that I chose for the binding makes a nice frame around it all. While I enjoy designing a quilt, I'm not always as big a fan of the quilting. Remembering how long it took me to make all those straight lines on my first Heather Ross quilt, I felt a little tired when I sat down to work on this piece. Then I decided, why not have fun with this one? So I did straight lines, wavy lines, echo quilting, free motion boxes, and even played around with several specialty stitches on my machine. Is it perfect? Nope. But I can tell you that this was by far the most enjoyable afternoon of quilting I've ever spent. I finished the quilt this afternoon, the same day that my husband wrapped up another year of teaching and came home to start two months of summer vacation with me and the girls. And I intend to enjoy every minute of it. Back in March I answered a Creative Troupe Callout by C&T Publishing to make a project using Kraft-tex, a heavy duty art paper. It was quite the challenge deciding what to make, but I finally decided on a portfolio featuring the paper as the outside cover. I added a patchwork detail to the front and fabric binding along the outside edges. Sewing with paper is tricky and not nearly so forgiving as fabric. I had to rip the patchwork piece off my first attempt and try again because when I pulled out some accidental stitches, the holes were still there in the paper to remind me of my mistake. Being super careful with the second attempt had better results. The inside has pockets for paper, utensils, cards, etc. I used some favorite fabrics for this piece, and I have to admit, it was hard to mail it off to the company knowing that it wouldn't be coming back to me. One of these days I'll have to make another to keep. Today I'm putting the binding on my second Heather Ross quilt. This one has been in progress for a while, and I'm so happy to be wrapping it up at last. I'll have pictures for you tomorrow, so be sure to stop by! Our usual family barbecue grew by leaps and bounds this year until we ended up with a guest list of seventeen wonderful friends and family getting together for a casual Memorial Day lunch. The last twenty-four hours have been a whirlwind of cleaning, cooking, and decorating. I pulled out all my WWII memorabilia for a quick and easy theme along with a CD of period music and old wartime Disney cartoons for the kids to watch during the meal. Target provided the great picnic utensils and food baskets. My husband barbecued hot dogs and bratwurst, and everyone contributed side dishes. The dessert table was by far the biggest hit of the day, featuring a make-your-own-brownie-sundae bar. My mom made her famous homemade chocolate sauce, and because I love you all, I'm sharing the recipe here with you. It's a snap to make and tastes absolutely divine. Combine the sugar and cocoa in a saucepan. Use a whisk to stir in the milk and add the butter. Bring to boil over medium heat. The longer you cook it, the thicker it will be -- just be sure to keep stirring so it doesn't burn! Reduce the heat. Cook and stir for one more minute until the mixture is slightly thick. Remove from heat, stir in the vanilla, cool slightly, and serve. To reheat, just place the saucepan back on the stove and return the mixture to a boil again, stirring until smooth. Mothers of the world, do yourself a favor: make a floor pillow for each of your children. I love these magic cushions. All I have to do is toss them around the room and say, "Go sit on your pillow." Instantly every child makes a dive for their spot and is perfectly happy to sit there while they watch a show, eat their snack, or look at a book. And when the pillows are spread far enough apart, nobody is close enough to poke, swat, or generally annoy anybody else. I'm in heaven, I tell you. At last, keeping the peace doesn't seem to be an utterly impossible task in my family room. After finishing Bunny's pillow earlier this week, I instantly saw the potential and worked feverishly to complete one for Bear and then one for Mouse. As I said in the first post on these, the squares are all exactly the same. I just mixed them up a little and quilted them differently. Bear's top has wavy vertical quilting down the front, and I stitched a quarter inch away from each seam on the top of Mouse's pillow. I also left off the border on the last two pillows which made the covers fit a little more snugly, just the way I like them. Bunny prefers the loose fit of her pillow, though, so everyone's happy. Linking up with the Blogger's Quilt Festival. Size: approximately 45 x 46"
My girls have a fixation on pillows. I'm constantly catching them in the act of dragging all the ones I've made off the couches and piling them in the middle of the family room so that they can jump and roll all over them. I decided that it was time to give them pillows that were actually supposed to be on the floor, so I bought three monster cushions on sale at Joann a while back with good intentions to have these made before summer vacation kicked in. This morning I finally finished the first one. I splurged on a fat quarter bundle of Full Moon Lagoon by Mo Bedell to use specifically for these pillows. This collection is gorgeous -- I love the range of colors. I tossed in a few black and white prints for variety and edged the front of the pillow in a black and white sketchy print from Architextures. It's interesting to me how making a pillow cover this large is almost like making a baby quilt -- this cover finishes at about twenty-nine inches square! I cut three sets of the six inch squares I used to make the pillow top, so all three girls will have essentially the same pillow. I'll just mix up the squares a bit and quilt each one differently so they can tell them apart. The back is my standard envelope closure, which I actually found to be a little tricky at this size. I had to carefully watch the edges as I stitched around the pillow to make sure that the fabric didn't pull loose. It wasn't quite as snug as a smaller version when I pulled the clips off during sewing. Thankfully I only had one little mistake that was easily fixed. Linking up with Fabric Tuesday and Sew Cute Tuesday. My little Bear will be turning four on Sunday, and my husband's parents are arriving in town any minute to spend the weekend with all of us. There are a hundred things on the to-do list, but I wanted to quickly share the patchwork case I made for Bear's birthday present, which is a Leapfrog Scribble & Write. So many toys and videos are designated "educational" these days, a label which can be widely overused as far as I'm concerned, but all my experience with Leapfrog products has been fantastic. I think we own every one of their dvds, and I can't believe how much my daughters have picked up from them. Mouse has learned all of her letters and their sounds, just by watching "The Letter Factory" a million times. Using some yarn dyed essex linen in leather, a fat quarter from the Fox Hollow collection, and a few 2.5" patchwork squares, I whipped up a quick gadget case last night. There's a strap so she can carry it around with her, padding to keep the toy cushioned, and velcro for easy access. Best of all, I can give it to her in the case so it doesn't have to be gift wrapped. Make that ninety-nine things left on the to-do list. List a few favorite quilting notions: Clover clips have become absolutely indispensable to me, especially when I'm making a bag. Pins just can't hold the pieces together as firmly. I also finally caved in and bought my first can of basting spray. Now all I can think is...what took me so long?? I want to buy a case of this stuff! It's made my small quilting projects so much easier to manage, and I love how quickly it can be applied. Any advice for a successful color scheme of a quilt? I'm still learning about this, but I'm finding that I really love the look of a project that has a mix of different prints from different collections. I've been practicing more often through my Fabric Auditions, which I'm trying to post weekly on the blog (I know I've missed a few weeks lately, but I'm trying to get back on board again...), and it's been a great learning experience for me. A few tips I've learned so far: 1) sticking to a specific color scheme makes a quilt look so much more pulled together, 2) try to vary the lightness and darkness of the colors within that scheme, 3) throw in some neutrals -- I'm loving plain old white and black these days, and 4) try to mix up the types of prints you use: dots, stripes, flowers, checks, solids, etc. The more you practice, the easier it comes, but I've learned to trust my instincts about what I choose. If I don't love it, I keep looking until I find a mix that makes me happy. Do you have free tutorials on your blog? You can find them all right here. My Patio Placemats have been featured on several websites this month, and they make a great easy project for picnics and patio dining. Any tips for sewing organization? I have a post on how my sewing room is organized which you can see here. A few things have changed since then, the biggest thing being that I have a fantastic new sewing table, but otherwise the place looks basically the same. Could you recommend a book to someone that just started quilting? The book that had the biggest impact on me as a fairly new quilter was Zakka Style by Rashida Coleman-Hale. It's not specifically about quilting, but it introduces you to a host of different techniques and types of projects. That book taught me how to how to install a zipper, how to sew hexagons, how to make my first bag and pouch. It opened up a whole new world to me of projects that I could do and gave me a love for zakka projects and linen in general. I will always have a special place in my heart for that book. Share a favorite quilt made by you. Every quilt has special feelings attached to it for one reason or another. It's so hard to choose, but I narrowed it down to two of my favorite quilts. Memory is full of scraps from my first year of sewing and now resides on the bed I share with my husband. I love the memories that are wrapped up in that quilt. Once Upon a Time is a quilt I made for my daughters featuring Heather Ross prints I had been saving for over a year. It's the most improvisational quilt I've made to date, and because of that, it was a real challenge for me. Right now I'm working on a second one of these for my grandmother which I hope to finish in the next month. Don't do like me...and hurry through your sewing. So often I get excited about a new project, get into the sewing, and then get distracted by other ideas and deadlines. I end up rushing through the end of the project, not always giving it my best, and not enjoying it nearly as much as I should. I need to remember that the process matters just as much as the product, or as my dad once said, "It's supposed to be a hobby. If you're not having fun, it isn't a hobby anymore." When I slow down and take time to enjoy myself, my projects look better and I have so much more fun making them! I hope something in here is helpful to all of you. Be sure to drop by the link-up at Geta's blog for more great ideas and advice! It's been about a year and a half since I started sewing on a regular basis again, and while I've tried lots of different projects, I've learned that one of my favorite things to make is bags. There's something so amazing about making a purse exactly the way you want it to be, and with all of the great fabric and hardware out there, it can look just as good as (and in some cases, even better than) what you can find at the store. I personally love the look of a structured bag, but it can be a little more time consuming than your average tote. My first experience with this style was with my Retro Library Case, and then later I tackled the infamous Weekender. Lately, I've done some more experimenting with my Patchwork Bag and Mosaic Bag, and this week I finally put together a tutorial for making this version, which I'm calling my Timber Mosaic Bag. For this one I used fabric from the gorgeous Timber and Leaf collection by Sarah Watts which paired perfectly with the leather yarn dyed essex linen I've been saving. I love how the linen reminds me of wood grain against these prints. The inside of the bag is a light blue print by Denyse Schmidt, and the interior pocket matches the patchwork on the front. This one is large enough to carry a few books along with my usual necessities. Because this bag is larger, I divided my back pocket into three sections this time. I adore that bear on the back! A pine cone charm that I bought on sale at Anthropologie was the perfect finishing touch for the zipper. A few notes before we start the tutorial... This version is larger than my first attempt, coming in at 13" square rather than the 9" square original. It also uses three inch squares for the patchwork instead of the more involved 1.5" squares I used to make the mosaic on my first one. I added a pocket to the inside of this bag as well. These are all details that can be easily adjusted depending on what you want your bag to look like. I find that when you're making a bag with a gusset (that's the material that joins the front and back panels together to make the sides), you have to be willing to go with the flow and keep checking your pieces as you sew to be sure that everything is going to fit right. If mistakes happen -- and they do -- don't panic. You can usually fix things easily by folding material (if a piece is too big) or sewing in an extra piece (if it's too small). While this type of bag can look rather difficult (they scared me to death when I attempted my first one), it's really a pretty straightforward construction job. Just take it a step at a time. 1. Sew together the 3" patchwork squares in a 3 x 3 grid using a 1/4" seam allowance. Attach the patchwork piece to the 8" batting square with basting spray and quilt as desired. Add the 3 x 8" and 3 x 13" linen strips to frame the patchwork using a 1/4" seam allowance. Attach the front panel to the 13" square of batting with basting spray. Quilt 1/4" and 1/2" from the outside edge of the patchwork square. 2. Sew the 4.5 x 13" linen and 8 x 13" cotton print together along a 13" side so that the cotton print is at the top of the piece when they are joined. Fold the cotton print back, wrong sides together, making the top of the cotton print even with the bottom of the linen, forming the outer pocket piece (see photo). Sandwich the 6 x 13" piece of batting between the folded layers and stitch 1/4" below the line where the two fabrics meet and 1/4" below the fold itself. Attach batting to the 13" linen square for the back panel with adhesive spray. Baste the pocket in place along the bottom edge of the back panel about 1/4" from the edge. Sew one or two lines down the pocket to divide it into sections if desired. 3. Make the interior pocket. Fold the 6 x 12" cotton print piece in half (wrong sides together) so the fold is on the top. Iron the 6 x 6" square of light interfacing to one side, trim the edges, and stitch around the open edges, leaving a large enough opening in the bottom for turning. Turn right side out, press, and topstitch 1/4" from the fold. Tuck in the bottom edges, press, and pin it in place on one of the 13" interior panels, centered and about 3" from the top. Stitch 1/4" from the edges, leaving top open and backstitching at both ends. 4. Finish the outer panels. Attach the 13" heavy sew-in interfacing and interior lining pieces to the front and back panels with basting spray, making certain that each panel has a linen piece showing on the exterior side and the cotton lining print on the interior side (double check twice if you're using directional prints!). Baste 1/4" from the edge all the way around both panels. 5. Make the handles. Fuse the light interfacing to both 2.5 x 20" linen pieces. Fold each piece in half (with interfacing on the inside), press, unfold. Fold the long edges to meet at the center fold, press, fold in half again, and press. Stitch 1/8" from each long side of the handle. Position a handle on the exterior of each panel with the raw ends poking up about 1/4" over the top edge and with the outside edge of each strap about 3.5" from the outside edge of the panel. Stitch 1/4" from the top edge of the bag over each strap to keep them in place while you work. 6. Make the zipper portion of the gusset. Cut off the ends of the zipper (keeping the sliding pull in the middle!) so that it measures 23". Fuse light interfacing to the zipper and gusset lining pieces and, and use adhesive spray to attach the batting to the linen for the exterior zipper and gusset pieces. Stack from bottom to top: cotton zipper lining (right side up), zipper (right side up), and linen zipper exterior piece (right side down) -- lining them up along one long end of each piece (see photo). Stitch 1/4" from the edge -- use a zipper foot if you like, though I just use my 1/4" foot for this. Fold back the linen and lining so that the wrong sides are together and press. Stitch 1/2" quilting lines from the zipper to the edge of the fabric. Repeat this process with the pieces for the other side of the zipper. 7. Attach the rest of the gusset. Stack from bottom to top: gusset lining (right side up), zipper piece (exterior linen up), and gusset linen exterior (right side down), matching up the raw ends (see photo). Stitch 1/2" from the end. Flip the gusset pieces so that the wrong sides are facing each other and stitch 1/2" from the end of the zipper (see photo). Repeat on the other side of the zipper and gusset after first checking the length of your pieces around one of the panels. Make sure you're happy with how things are lining up before you attach the rest of the gusset to make the full joining circle. Quilt the gusset in 1/2" lines that match those on the zipper piece. If you need to take up slack in the gusset due to quilting, just fold the extra fabric and stitch over it. 8. Use Clover clips or clothespins to clip the gusset in place on one panel, centering the zipper on the top of the bag panel so that the ends fall as evenly as possible on the sides. Sew 1/2" all around the bag. Go slowly and carefully, keeping the rest of the bag out of the way as much as possible while you sew. Repeat on the other side, making sure that the zipper is at least half open before you start! Trim the edges down to about 1/4", cutting carefully so that you don't accidentally cut into the panels or gusset. 9. Take both 2.5 x 50" strips, fold them in half lengthwise (wrong sides together), and press them. Take one piece and sew the ends of the strip together to make a full circle, then do the same with the other. Use this to bind the interior raw edges just as you would the edge of a quilt (see my links page if you need help with the binding process). Turn the bag right side out, press, and enjoy! Thanks for sticking with me through the endless journey that is a tutorial! If you have any questions, feel free to leave a comment here or email me any time at hjstaples@gmail.com. If you make one for yourself, I'd LOVE to see it. You can upload pictures of your bag -- or anything else you've made from one of my tutorials -- to my blog's flickr group here. Linking up to Fabric Tuesday & Sew Cute Tuesday.